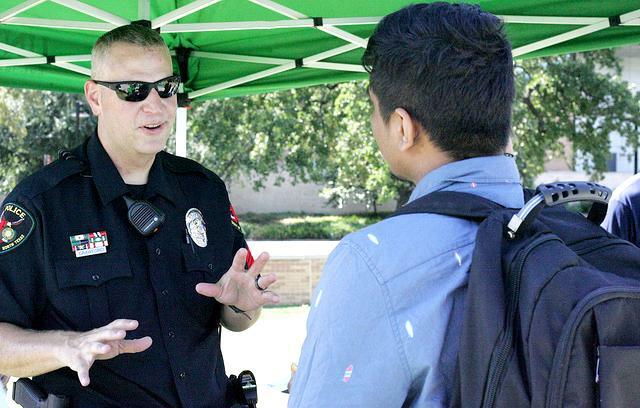 On Friday, Aug. 31, both UNT and the city of Denton honored International Overdose Awareness Day by holding separate events to mark the occasion. 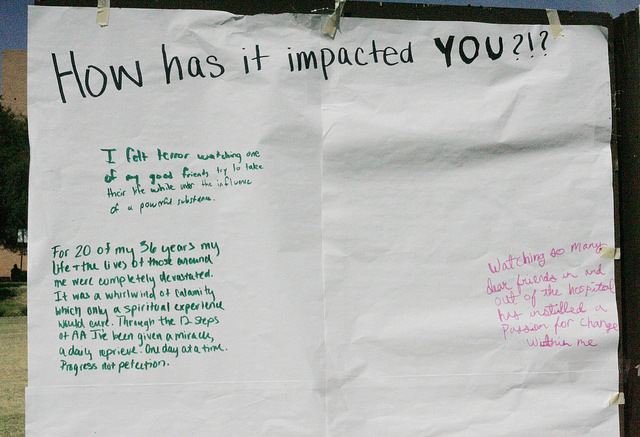 UNT held the event from 11 a.m. to 1 p.m. on Friday on the Union’s South Lawn, where food was served, organizations tabled and attendees could remember their lost loved ones by writing messages on a memory wall. UNT’s International Over Dose Awareness Day event had a steady stream of people participating and speaking to the organizations tabling while people handed out free items such as bracelets and sunglasses. There was also a petition circulated around for Representative Michael Burgess of TX-26, by 23-year-old grad student Farrell Stucky, who lost her brother Holden to drug addiction when he was 24. “It’s asking [Burgess] to refuse to accept future campaign contributions from the pharmaceutical industry,” Stucky said. Stucky also said the petition is asking Burgess to institute stricter oversight for the prescription of opiates, funding retribution measures and education and resources for those who are addicted. Though UNT’s event ended at 1:00 p.m., that was not the conclusion of International Over Dose Awareness Day in Denton County. 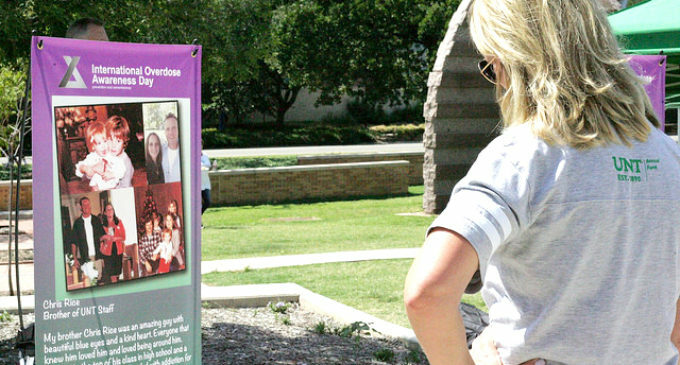 From 6:30 to 8 p.m. on Friday at the Denton County Courthouse, the Denton International Over Dose Awareness Day event took place, with a lineup of speakers and numerous organizations tabling. Sharon Roland, whose son Randy Roland overdosed at age 32 in 2016, organized the Denton event after not being able to attend the Austin International Over Dose Awareness Day event a second time last year due to Hurricane Harvey. Denton’s event also served as a remembrance of those who lost their lives like Randy, Roland said. More than 50 people came to the Denton County Courthouse to honor International Over Dose Awareness Day. Roland said it is pretty overwhelming to host Denton’s first International Over Dose Awareness Day. The lineup of speakers began with Denton Mayor Chris Watts, who read a proclamation declaring Aug. 31, 2018 as North Texas International Overdose Awareness Day. Following the mayor, speakers ranged from law enforcement figures to people with personal stories. During his time at the microphone, Sgt. Kevin Crawford from the UNT Police Department cut the ceremonial ribbon, made of yellow caution tape, for their new purchase – a drop-off box for unwanted prescription drugs that will be located in the lobby of the UNT Police Department 24/7. “We wanted to provide the public a place they could go, 24/7, 365, to safely dispose of controlled substances with no questions asked,” Crawford said while speaking to the crowd. Amid the lineup of speakers, a bell rang about every seven minutes and someone from the organization Winning the Fight placed a cross on the fence of the grave located at the southeast corner of the square, to symbolize the fact that every 7.3 minutes, someone dies from a drug overdose. By the end of the event, there were 12 crosses hanging on the fence. Following the speakers, emcee Sarah Roland, the sister of Randy Roland, invited attendees to write a note to a lost loved one and tie it to a purple memorial balloon, which were released at 8 p.m., marking the official end to Denton’s International Overdose Awareness Day.